Greek Default Watch: Are Greeks Finally Embracing the Market? Are Greeks Finally Embracing the Market? A survey by Public Issue shows much stronger support for the market than previously assumed. On one level, this survey demonstrates increased awareness that a bloated public sector is at the center of the country’s failed economic model, and that growth depends on a stronger private sector. But in a broader sense, this survey can accelerate political change, helping to convince members of a torn administration that wholesale reform can be a political winner. 58% of respondents say public sector employees should not have lifelong tenure. The share of those supporting tenure fell from 40% to 35% within a year. 74% think privatizations are essential; only 21% doubt they are needed. 69% think the country needs to strengthen the private sector to generate growth. Support for privatizing state-owned companies has increased across the board, with the most dramatic changes seen in railroads (65% say yes vs. 41% in 2008), Postal Savings (54% vs. 32%) and gaming company OPAP (60% vs. 46%). Support for privatizing the power company has also risen from 40% to 48%, but the public remains torn. Only for the National Bank of Greece has there been a fall in the support for privatization. This survey reveals that Greeks are dismantling whatever rosy notions they may have entertained about the public sector. For years, the Greek citizenry has held a view towards the public sector akin to what Ashleigh Brilliant had said about corruption: “I either want less corruption, or more chance to participate in it.” Now more and more Greeks recognize that the country can no longer afford a large, inefficient, unaccountable, and generous public sector. What is more, they seem ready to talk about abandoning lifelong tenure, the most precious prerogative of public sector employees. Given the centrality of the public sector in Greece’s economic model in the last thirty years, this is good news. More broadly, these results demonstrate again that there is a public sentiment that favors tackling privileges in the public and private sectors. In the past I have written that the failure to tap into that sentiment, to articulate its frustration and to galvanize its anger into constructive change is PASOK’s greatest failure (see here and here). In part, it is a communications failure and in part it is unwillingness to alienate constituencies that have formed the party’s backbone for decades. But more generally, it is a failure to appeal to a wide political base without promising patronage: to court votes through vision rather than favor. This survey shows that there is indeed a large repository of support for abandoning the economic model of the last thirty years, and that the Greek citizenry will not rally to support either public sector unions with exorbitant salaries or professionals who resist competition in their sectors. The more this point becomes clear to the Greek leadership, the easier it will be to re-create consensus at the top in favor of real change. 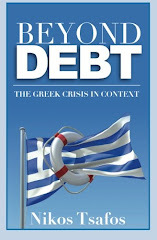 What Are Greeks Fed Up With? Is Roubini Right on Greece? Is Argentina a Model for Greece?